(October 15, 2013 – Culver City, CA) Sparks & Shadows is proud to announce the release of the DA VINCI’S DEMONS SOUNDTRACK (COLLECTOR’S EDITION) on October 22, 2013. The 2-CD set features Bear McCreary’s Emmy® Award-winning theme along with over 30 minutes of bonus music from the hit STARZ series, not included on the digital soundtrack album, released in May. 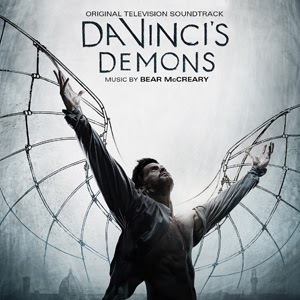 McCreary’s sweeping orchestral score for DA VINCI’S DEMONS was meticulously researched to accurately represent the time period, without being bound to it. His score combines full orchestra, Renaissance instrumentation, choir and ethnic soloists with the renowned Calder Quartet and surging contemporary synthesis. “In a weird way, even though I’m doing stuff that is done with Renaissance instruments, this is the most stylized show I’ve ever worked on,” said McCreary. This fall McCreary’s music can be heard on the new series Marvel’s Agents of S.H.I.E.L.D. McCreary continues to write for the television show The Walking Dead. Recently he lent his talents to Syfy and Trion World’s groundbreaking entertainment experience, Defiance, a combined launch of a MMO videogame. His film projects include Europa Report and Knights of Badassdom. His other credits include critically acclaimed scores for series such as Terminator: The Sarah Connor Chronicles, Eureka, Human Target, and The Cape. His videogame credits include SOCOM 4 and Dark Void. Sparks & Shadows presents the DA VINCI’S DEMONS 2-CD collection available on October 22, 2013. The first 360 people who purchase the set through www.lalalandrecords.com on October 22nd will receive their set autographed by McCreary. Also available from Sparks & Shadows are the soundtracks of The Europa Report and Defiance (video game) and Defiance (TV series). This is one his best works, though everything Bear creates is a masterpiece and act fast for a autographed edition.